It's a pity that just when I was stepping out of my European comfort zone (by making anko which Ive already made several times, so not sure if it counts), I run straight back in. Because last weekend I made bread. But not any bread. I was still out of my comfort zone with these bagels. I mean, a dough that you shape directly after kneading it and don't ever bother to knead after the first rise? A dough that you cook in water before baking it? It sounds like madness. Bagels are very popular in New York and the rest of America. 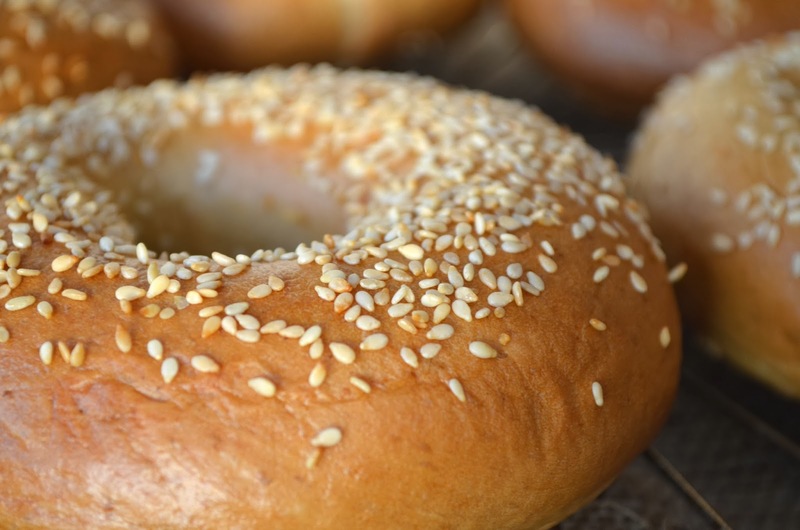 The bagel tradition is thought to have been brought to American by Jewish immigrants from East Europe. It was in or around Germany or Poland where they were first invented. 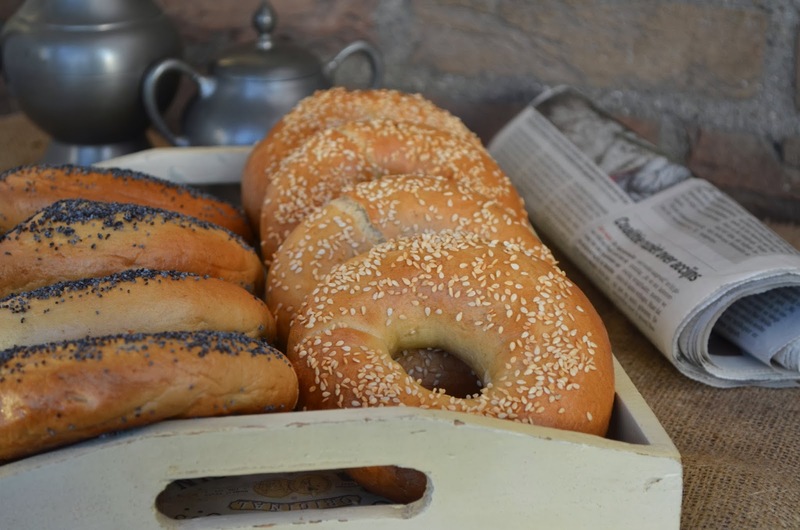 The word 'bagel' is derived from the German worden 'beigen' (to bend) or the Yiddish word 'beygl'. 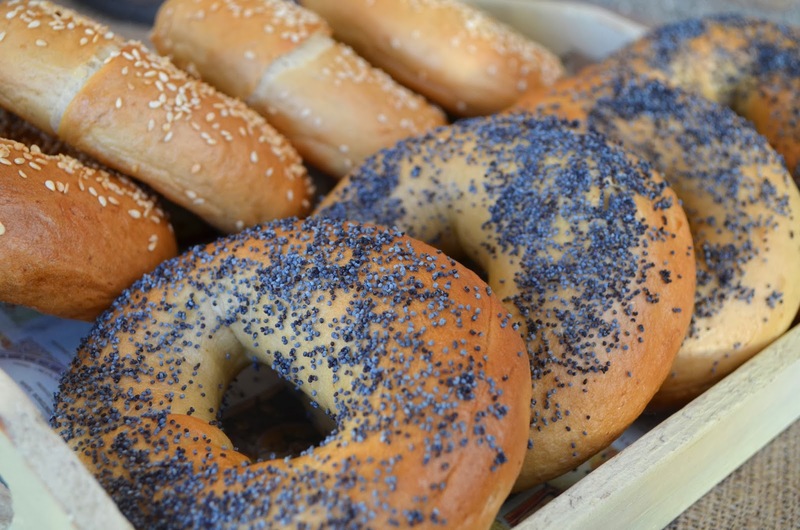 Because of their shape bagels were thought to represent the eternal cycle of life and were given to women in childbirth in Poland in the 1600's. As with any food traditions this is just speculation. There are sources that state the bagel was invented in Italy or Russia. 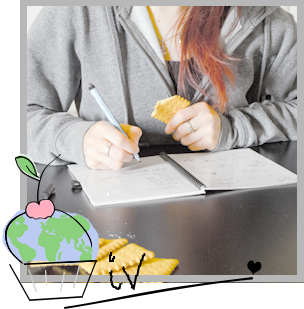 Since food used to be very closely tied to local traditions and produce, every city or town had its own version of bagels. Some cities didn't bother, some did and sometimes the tradition spread to places as far as America. As with anything that was invented many, many, so many years ago there are variations of it all over the world. However, the bagel I'm sharing is the American-New York type bagel. 1. Whisk the flour, rye, yeast and salt together. 2. Mix the water with the molasses (or other) and oil and pour it over the dry ingredients. Knead for at least 10 minutes until you get an elastic dough. If you have a bread machine, it might be a good idea to use the dough setting. Add more water or flour if required. 3. Divide the dough into 10 equal parts and roll them into bagels by using the special bagel-making method (see below). 4. Place the bagels on a baking sheet and cover with a damp cloth or plastic foil and leave to rise for 1 hour. 5. Preheat the oven to 225 degrees Celsius or 440 degrees Fahrenheit. 5. Prepare the "poaching liquid" by putting the potato starch in a large pan with a few tablespoons water (to prevate lumps). Then add the remaining water, sugar/syrup and salt. Leave on the stove on high heat until the water starts to boil. Reduce the heat, but keep the water boiling. 6. Carefully place a bagel in the water and boil for 1 minute. Turn over and boil for another 30 seconds. Place back on the baking sheet. Sprinkle your topping over the bagel while it's still wet. Repeat with the other 9 bagels. 7. Reduce the heat of the oven to 200 degrees Celsius or 390 degrees Fahrenheit and bake the bagles for about 20 minutes until golden brown. Apart from the fact that I really didn't know bagels were first cooked before baking, I also didn't know yiddish was a language. Yiddish is also called Jewish, has 6 different dialects and is not widely recognized as a language, but in stead holds the status of a dialect. Wauw, who knew? 1. Roll a piece of dough into a long cylindrical roll. 2. Roll one side into a point, flatten the other end. 3. Bring the two ends together: the pointy side on top of the flat end to make a circle. 4. Wrap the flat end around the pointy end and pinch around the edges to make the ends stick together. 5. Done. Could you follow? 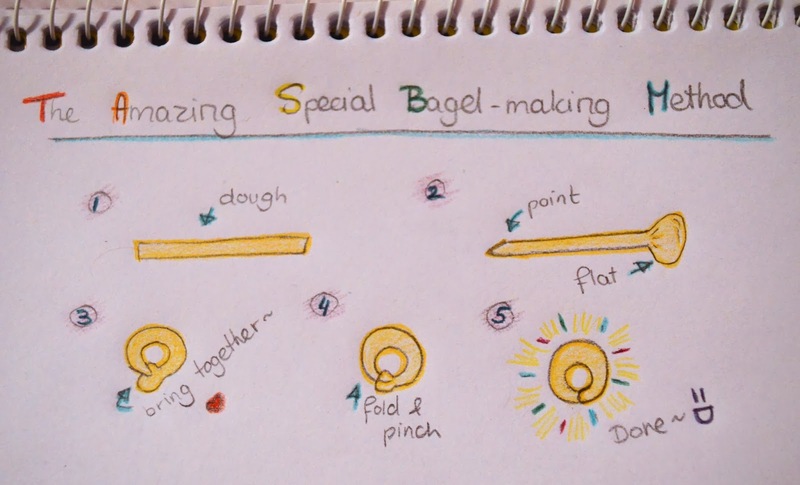 Those bagels look perfect and I love your hand drawn diagram for the bagel making method! Aww, thank you so much for the sweet compliments Aimee!